Auditory Processing Disorder (APD), sometimes also known as Central Auditory Processing Disorder (CAPD), is a neurological condition affecting the way the brain processes auditory (sound) information. APD is not related to the ability to pick up sounds through the ears, but to how the signals from the ears are processed in the brain. This may lead to difficulties in recognizing and interpreting sounds and speech. Because APD can lead to lack of attention, difficulties with spelling and writing, or lower educational performance it can be the underlying cause of conditions such as Attention Deficit Disorder (ADD), Dyslexia or Learning Difficulties. Cocktail Party Syndrome, difficulty in following a conversation in a noisy environment, falls within the scope of APD. The Auditory Processing Disorder Special Interest Group of the British Society of Audiology states: "APD is characterised by poor perception of sounds, has its origins in impaired neural function, and impacts on everyday life primarily through a reduced ability to listen, and so respond appropriately to sounds." APD is often poorly understood or recognised within the medical and educational professions. It is currently not included in the Diagnostic and Statistical Manual of Mental Disorders - Fourth Edition (DSM-IV), published by the American Psychiatric Association. Ear, Nose and Throat (ENT) professionals often concentrate on the ability to hear, rather than to understand, while Speech and Language Therapists (SLT) often concentrate on the physical aspects of speech production. The field of APD lies between these two competencies. There is, however, a move to increase the awareness of APD within these professional circles. An excellent professional resource book is "Auditory Processing Disorders" by Donna Geffner and Deborah Ross-Swain (editors), Plural Publishing Inc., 2007, ISBN: 978-1-59756-107-5. Sound Localisation - the ability to identify the source of sound. Sound Lateralisation - the ability to know where sound has occurred in space. Auditory Discrimination - the ability to distinguish one sound from another. Auditory Pattern Recognition - the ability to determine similarities and differences in patterns of sound. Temporal Aspects of Audition - the ability to process acoustic stimuli over time. Auditory Performance Decrements with Competing Acoustic Signals - the ability to perceive speech when another signal is present. Auditory Performance Decrements with Degraded Acoustic Signals - the ability to perceive a signal in which some information is missing. Easily distracted, especially in background noise - hearing the background more prominently than others - thus interfering with the foreground message. Problems with spelling, reading and academics. Remediation of the auditory deficit itself. Changing the environment, when possible, can make a big difference. In general, a quieter room with less reverberation, will often help. A direct visual line of sight, allowing the person with APD to see the lips and fascial expressions of the speaker, will also aid cognition. Slower speech, backed up by visual information will also be of benefit. Compensatory strategies can include fixed activity routines, standardised follow-order of instructions, substitution of verbal instructions by visual clues, memory aids and boosting assertiveness which will ease requests for assistance. 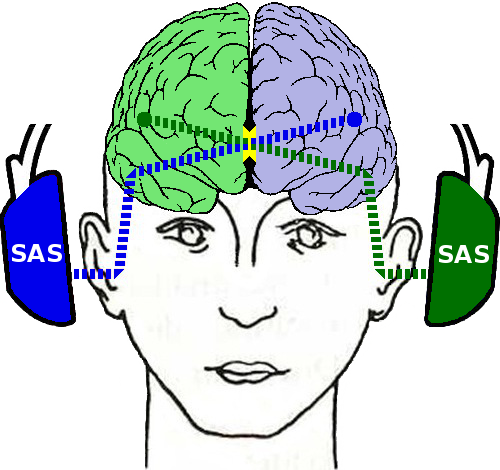 Remediation of the auditory deficit is an area of specialisation by SAS. The SAS developed programmes aim to instill more effective auditory processing habits in the brain and the combination of inter-hemispheric music movement programmes and hemisphere specific language programmes often can make a difference. Obviously it is important to tailor the programmes to the needs and abilities of the person suffering from APD. Faster and more efficient auditory processing, and strengthening of the language and speech centres in the left side of the brain can be achieved in a short space of time through intensive neuro-sensory training. We offer a range of condition-specific courses at SAS Centres, through SAS Practitioners, or as a SAS At Home course. Tailor-made brain training that can make a real difference! Reduce the background noise at home and at school. Provide your child with a quiet place to study. Make your child aware of distracting environments so that they learn to move to quieter surroundings themselves. Speak slightly louder and at a slower speed. Ask your child to repeat any directions given. Write longer directions down on note paper. Provide your child with a note pad, so they can jot down instructions. In school place your child at the front of the class and away from distraction sound sources such as open windows or doorways.